Do you get confused every morning around which earrings to wear to work? Guess what, you are not alone, dear. This is a dilemma that most women face. 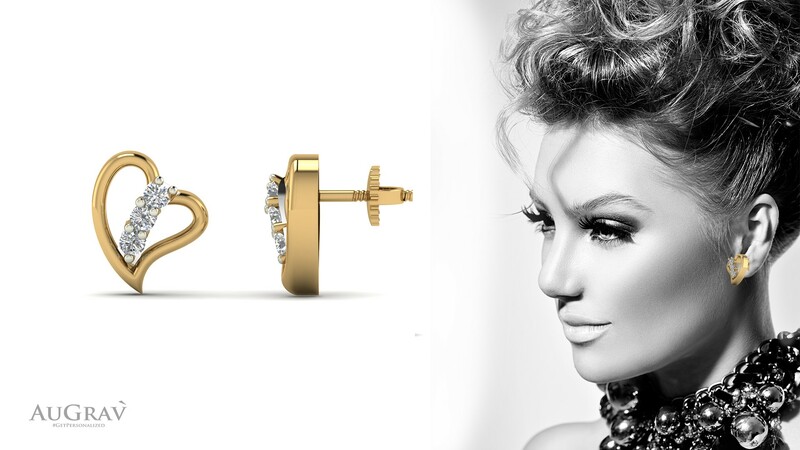 When going out for a party or a casual occasion, you can choose any earrings. And even if they are on the fancy side, there won’t be any repercussions. But in an office setting you are not supposed to wear one of those party earrings, right? Imagine you are in an office meeting giving a presentation and the participants get distracted by your over the top earrings. Yes, that would be bad. So, be careful while you choose what you wear to office, especially when it comes to earrings. Scared? Don’t be! Because we bring to you the ultimate collection of office wear earrings. Each of the earrings in the collection are made considering the modern day working woman and her choices. Listed below are ten of the magnificent earrings from our workwear earrings collection. Enjoy! So, you are a girl who likes personalized accessory! 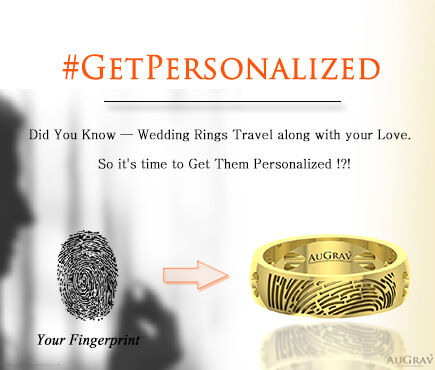 You are always on the lookout for personalized jewellery. But when it comes to office accessories, you aren’t able to find the perfect personalization, along with the sophistication that is needed for an office setting. We bring to you just what you were looking for. Our elliptical fingerprint pendant! Yes, your fingerprint on your own accessory. 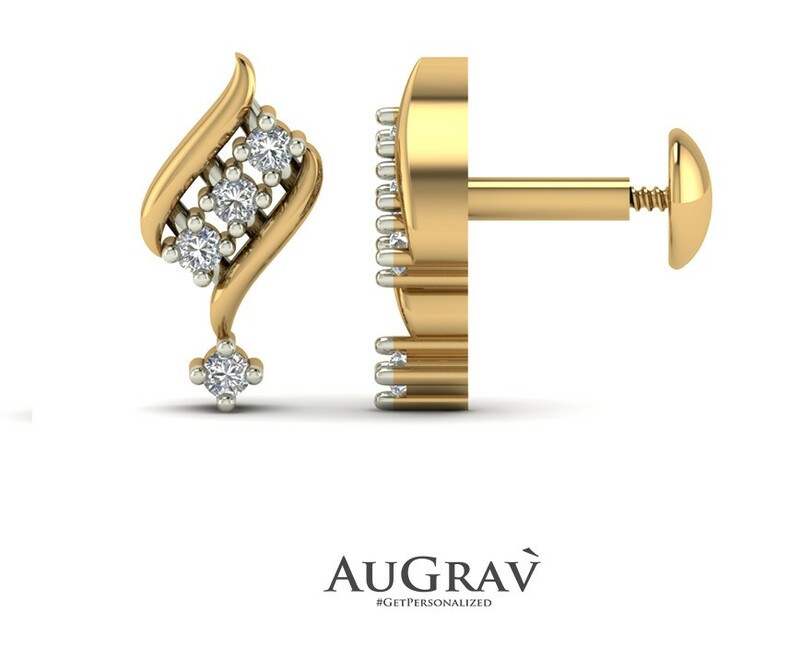 And not just that, each piece has three tiny diamonds, one at the bottom and two on one side, to accentuate the appeal of the earrings. Another pair for the queens of personalization! This time it is the initial of your name. 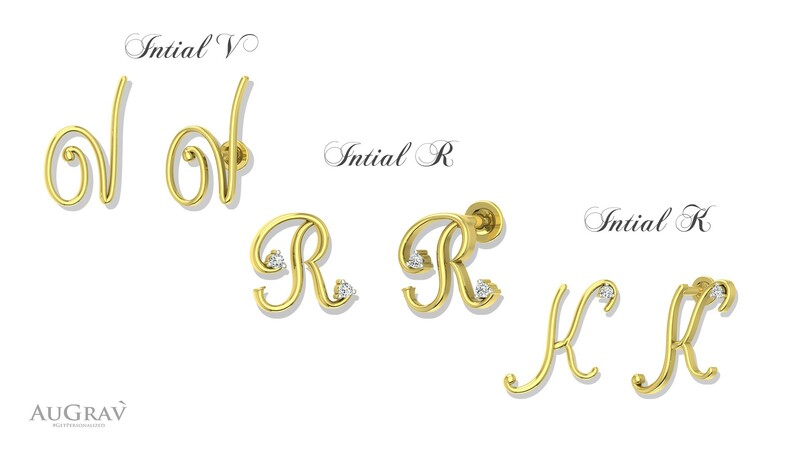 This pair of earrings will be of the stud style with the initial of your name crafted in a beautiful font of your choice. You can also opt for diamonds or other precious stones as embellishments to take the look and feel to the very next level. 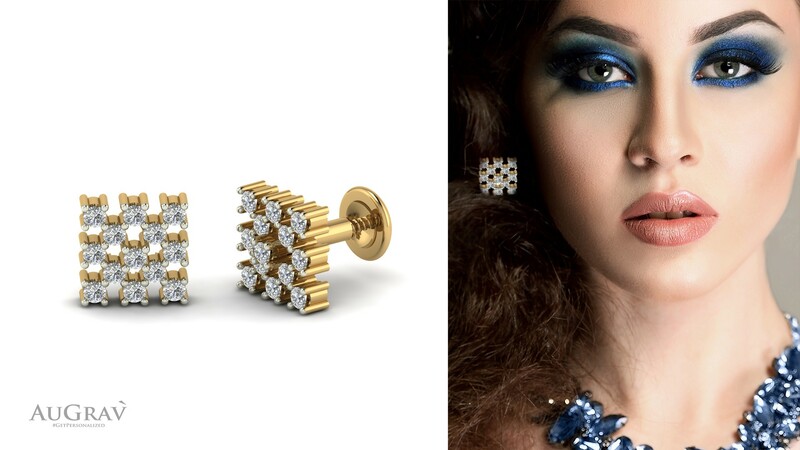 Diamond lovers, you will love these earrings! There is hardly anything that pleases a woman more than the sight of diamonds on gold. 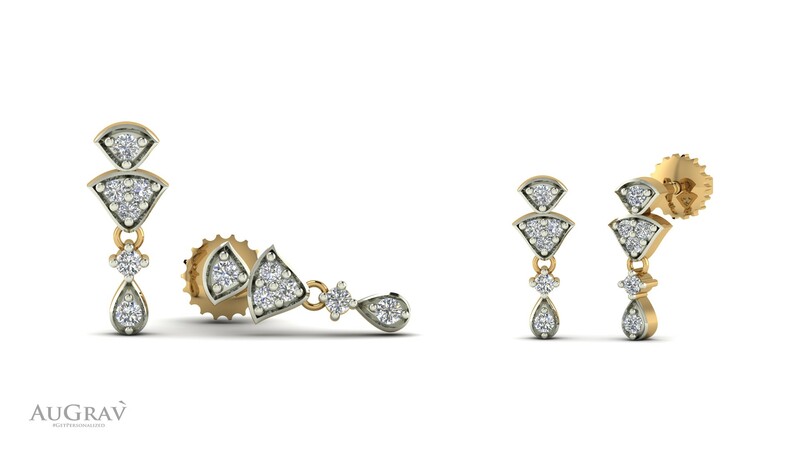 Our Eminent Diamond Stud earrings bring to you the exact same design of gold and diamond. And the best part about these studs is that you can wear them to parties as well. Planning to wear a traditional outfit to office and not sure on which earrings to go for? Our breezy golden drop earrings would be the perfect choice. These earrings have a four tier design with each tear showcasing marvelous diamonds. The earrings will be crafted in the metal of your choice and you can also opt for any personalization that you have in mind. Show some love with these trendy heart-shaped earrings on Fridays! Subtle yet sensuous, these earrings can uplift your entire attire. The heart is accented with a strip of dazzling diamonds, making these earrings the perfect office accessory. You can select from a variety of metal options to craft the pieces and can also select the stone of your choice for the embellishments. Geometric shapes always exude a sense of sophistication. So, what about using geometric shapes in your office earrings. Sounds like a good idea, doesn’t it? 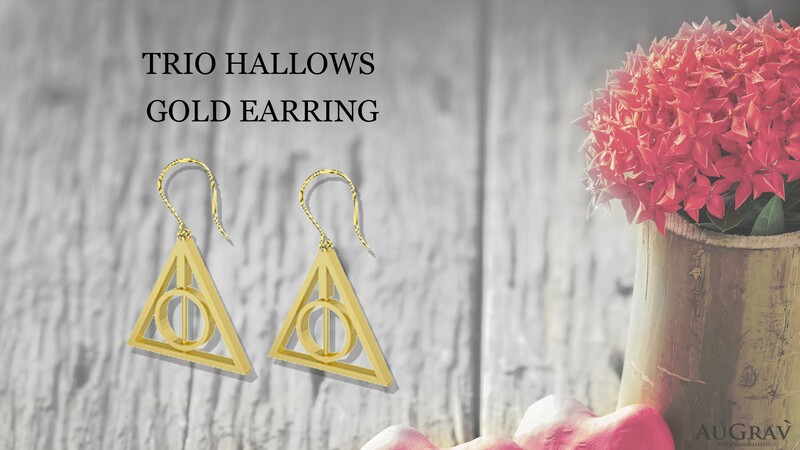 Take a look at the Trio hallows gold earrings and you will have to agree with us. 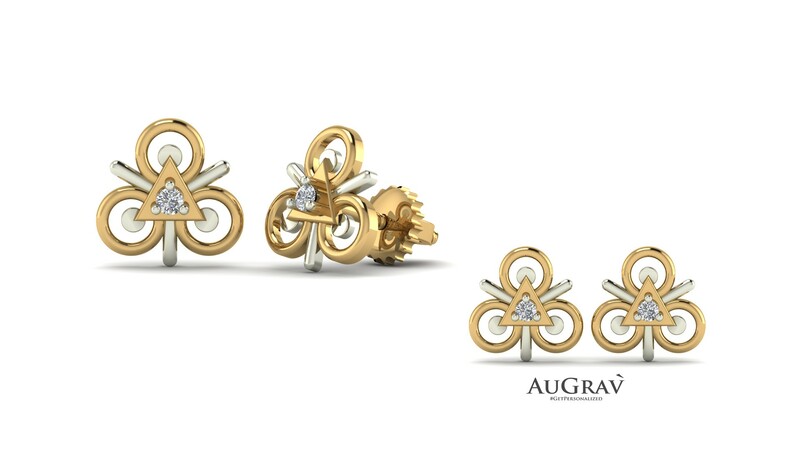 A circle inside a triangle connected to a hook closure make these earrings a masterpiece. Another set of earrings that will complement a traditional outfit the best! Be it on rings, earrings or other accessories, filigrees always entice a woman. So, we thought of coming up with an earring design that is completely based on filigree. These circular filigree gold earrings have spokes-like filigree that start from the center and move outward. If you are looking for something more sensual, then this pair of two leaf golden studs would be the perfect choice. 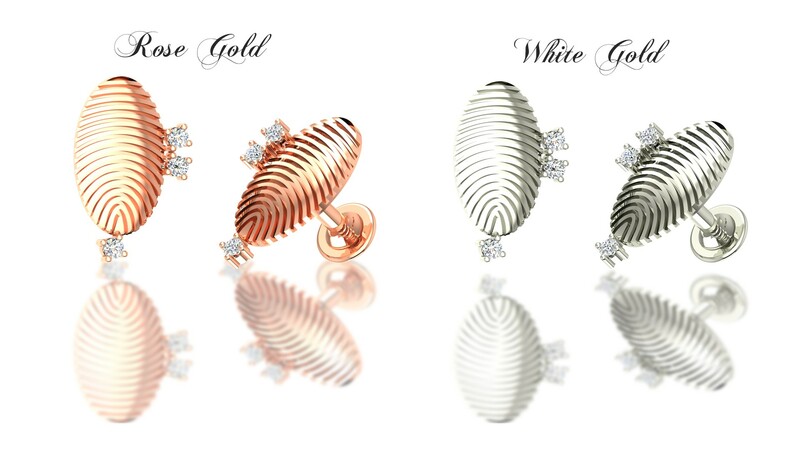 Two beautifully crafted leaves end with delightful diamonds, one smaller and the other one slightly larger. The yellow gold beautifully complements the diamonds, adding the perfect amount of glamour to your office attire. This one is slightly on the trendy side! But if you are woman who loves to experiment with her office looks then these fabulous diamond drops are the best choice. Rich in diamonds, these earrings boast a delightful design, one that is both classy and charismatic. And we need not tell you that these earrings can also be worn for casual occasions. Being the fashionista that you are, you already know it. Another set of earrings which uses geometric shapes to perfection. Triangles, circles, lines, these earrings have got everything. If you are a girl who likes to wear shirts and trousers to work, then these Triangle diamond studs are the perfect accessory for you. The tiny diamond that sits at the center of the piece adds the right amount of sparkle and just elevates the look and feel of the earrings. « WANT TO ETCH YOUR CHILD’S DRAWINGS IN GOLD? EARRINGS TO STEAL THE SPOTLIGHT AT WORK! Overall rating: 4.7 out of 5 based on 235 reviews.